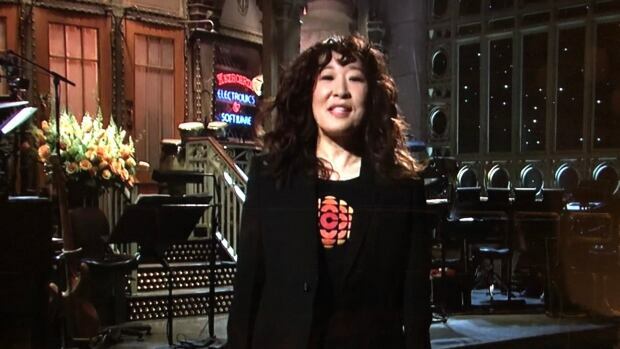 Fresh off her Golden Globe and Screen Actors Guild awards for the TV series Killing Eve, Sandra Oh is still, well, killing it — this time on Saturday Night Live. The Canadian actress got a lot of props online following her sketches, which included poking fun at Empire actor Jussie Smollett, the period film The Favourite and North Korea’s relationship with Russia and the U.S. But it was her Canadian roots that took centre stage during her opening monologue. Oh, who hails from Ottawa, explained the tendencies in her home country which often lean toward being “polite” and saying “I’m sorry” frequently. She mentioned it’s been a year since she gained U.S. citizenship. Later in the show, Oh came on stage to introduce musical guest Tame Impala sporting a CBC logo T-shirt. Her SNL appearance coincides with the second season of Killing Eve, which returns April 7. In addition to scoring multiple awards this year, Oh also co-hosted the Golden Globe Awards alongside Andy Samberg. Before the show on Saturday, Oh posted a personal video on her Twitter account, thanking the Canadian Improv Games, her drama teachers at Sir Robert Borden high school in Ottawa and to “everyone” with whom she did improvisation in the city between 1986-90 for helping her hone her skills. “I know one of the reasons why I’m here is because I played with all you guys,” she said in the video message.